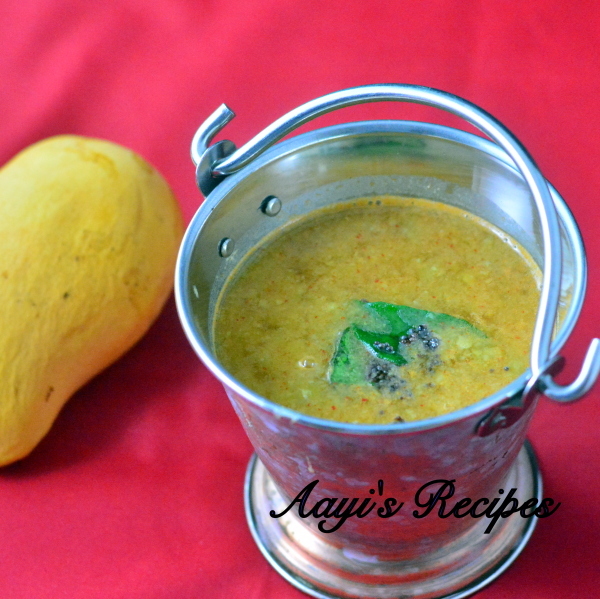 Few days back my friend Mahi had invited us for dinner and she made a delicious mango dal. It reminded me of the big batch of frozen mangoes I had bought from Costco. It was another purchase on the whim. I never made anything with them. 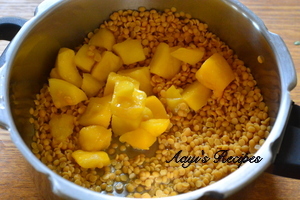 I usually make mango dal using this recipe. This time I wanted to try something different. When I started making it, I remembered a big batch of roasted fenugreek(methi) seeds powder that aayi made for me when she was here last year. I was supposed to consume that batch after Ayaan’s birth. I religiously did for a while, but there was only so much time left for myself after taking care of a 4 year old and an infant. Most of the days I was happy to put a decent meal on the table and find enough time to sit and eat. So the fenugreek powder stayed there. 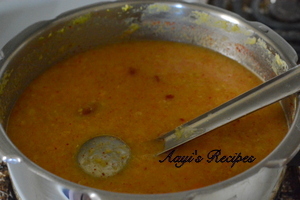 I used it in this dal and it elevated the taste of this simple dal. I have made this once every week since then. Even the boys enjoys it very much. Add spices, salt. Put seasoning and serve. Roast fenugreek seeds (without oil) till a nice aroma comes out. Make a powder and keep aside (this remains good for a long time when stored in airtight container). 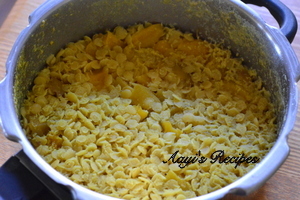 Cook toor dal with mango pieces, turmeric in pressure cooker (about 3-4 whistles). When pressure cooker is cooled down, mash dal with the back of the spoon. Add enough water to bring to required consistency. Add chilli powder, fenugreek powder, salt, kokum(or tamarind), boil it for few minutes. Take off the heat. Heat a little oil and add mustard seeds. When they start popping, add curry leaves. Pour the seasoning over dal. 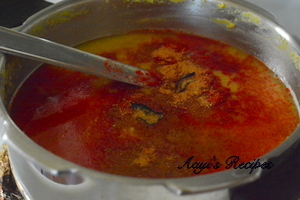 Serve hot with rice and ghee. Fenugreek(methi) powder has a bitter taste. So start with a smaller amount and adjust to your taste. What is the reason behind mashing the dal? Why is toor dal or moong dal always mashed in maharashtrian cooking? Some people do mash Toor Tadl (Ghotawtat).. but not all Maharasthrians do that, it perhaps helps when you are mashing it up for a child or older person. We have never done it in our household, but some of our relatives used to. Rohit, we usually mash it to make the dal more “creamy”. It is an optional step. I know some people do not like the dal completely mashed, it is more of a personal preference I feel. How interesting! For us, green mango dal is as routine as it’s special because it’s a summer delight but I’ve never come across one with ripe mangoes. Maybe I’ll make a much smaller amount and see if I like it. I think I have some kokum too, somewhere! This is very interesting combination..I will definitely try this. Oh…looks interesting. When I read mango daal, i was thinking ‘kairi’ and not ‘aamba’. Have to try this out. Nice recipe. Looks very tempting.